Setting up your Catalog allows you to create the products you sell and organize them all in one place. 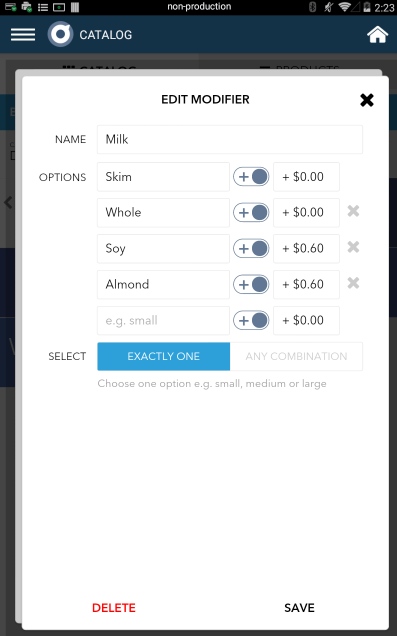 In the Catalog app you can group by category, making your products easy to access and add extras like fees, taxes, and discounts. Start by naming your Catalog. Click Catalog on the main screen, or login at Poynt.net to edit through the online dashboard. Some merchants use just one Catalog to store all of the items they sell. Others, especially restaurants, may have different several Catalogs for different ordering stations such as “Bakery” or “Grill”. Whatever you have selected as your prominent Catalog will be the active Catalog in the Register App. Grouping into Category: Group your products by category for quick reference when assisting customers and helpful reporting. Some common categories include Sandwiches, Cookies, etc. Applying fees, discounts, taxes: Fees, discounts, and taxes can be added to a Catalog for quick access when building an order on the Register App. These can be applied to a specific product (item-level) or to the entire order. These may be configured into a fixed amount or a percentage. Create Products: Products on the terminal are intended to reflect the items you sell in your store. You can simply add a name and price and your product is all set to go. Additionally, you can add SKUs for inventory management, edit the hot key color, and add modifiers. Adding Modifiers: Modifiers are options that add another level of specifications to a product. For example, under the product “coffee” there could be the modifier “size”. Pricing for specific modifiers can be added as well. Assigning your Catalog: To use a Catalog as a default for Register app you must assign the Catalog to your terminal. On Merchant HQ: You can do this at Poynt.net/catalogs by selecting the terminal icon labeled Assign. 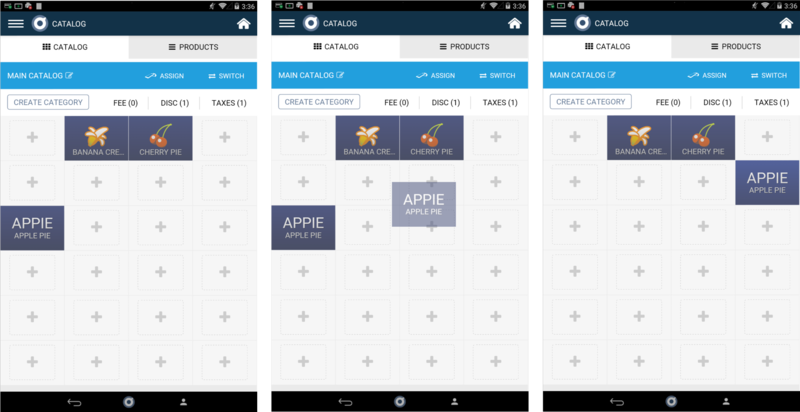 On Device: In the Catalog app, tap Switch and select the Catalog that you’d like displayed. Then, once displayed, the icon “Assign” will be next to the Switch button. Tap Assign. You can customize the location of their products on the Catalog app by with a simple drag-and-drop of the tile for quick selection in the Register app. Organize like-products or best sellers so you and your employees can find them quickly. Note: This is configurable both from the web at Poynt.net/products as well as on the device in the Catalog App.